Want to be notified of new releases in crosscite/doi-metadata-search? An online tool for searching for works in the CrossRef or DataCite metadata catalogue. Also allows users to find their works and add them to their ORCID profile. This project was started as CrossRef Metadata Search tool by CrossRef, the original code repository is here. 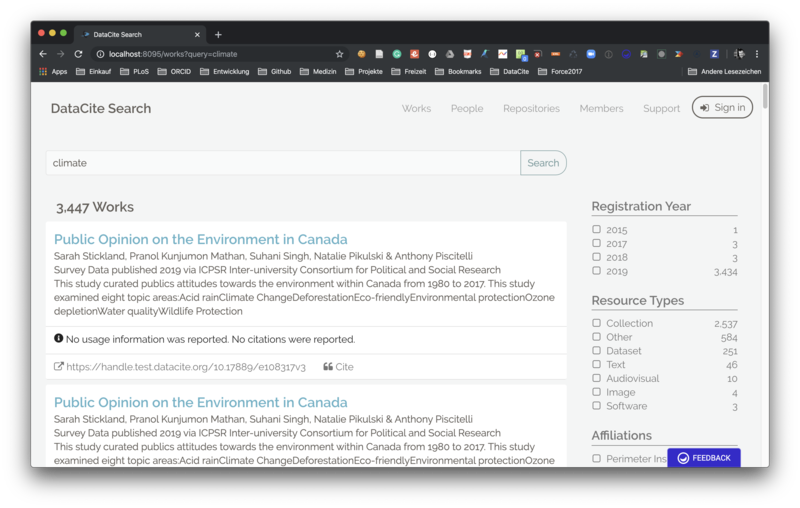 Later the code was extended to also work with the DataCite Metadata Search in a project by ORCID EU labs and the ODIN - ORCID and DataCite Interoperability Network. DOI Metadata Search combines these activities into a single codebase that works with both CrossRef and DataCite DOIs. You can now point your browser to http://localhost:8000 and use the application. For a more detailed configuration, including serving the application from the host for live editing and claiming works to ORCID, look at docker-compose.yml in the root folder. doi-metadata-search is released under the MIT License.